New technology like DMARC goes through a cycle of adoption. Typically, it starts off slowly and hits a pace of rapid adoption once larger companies find benefits in it. Sometimes smaller companies lead the way. In the case of DMARC, large inbox providers are leading the adoption of DMARC, DKIM and SPF to improve the quality of their anti-spam and anti-spoofing algorithms and decrease unwanted or malicious email attacking their users. MxToolbox’s Experts are continually investigating technologies that affect email deliverability. Blacklisting was once the key threat to legitimate emailers. Being on a blacklist could block your email from delivery. Now, without SPF, DKIM and DMARC, your email may make it past the blacklist filters and still never make it to your customers. DMARC works in conjunction with SPF and DKIM to report on the compliance of email sent on behalf of your domain. Inbox providers prioritize email from senders that have email that is SPF compliant and DKIM signed. The important thing to understand is that inbox providers look at your entire email volume, all email that uses your domain in the “From”, including your legitimate email, 3rd party senders, spam and spoofing. In some cases, spam and spoofing email sent on behalf of your domain may dwarf legitimate communications. The only way to know is to request DMARC summary reports from inbox providers, process those reports and take actions based upon key information in the reports. 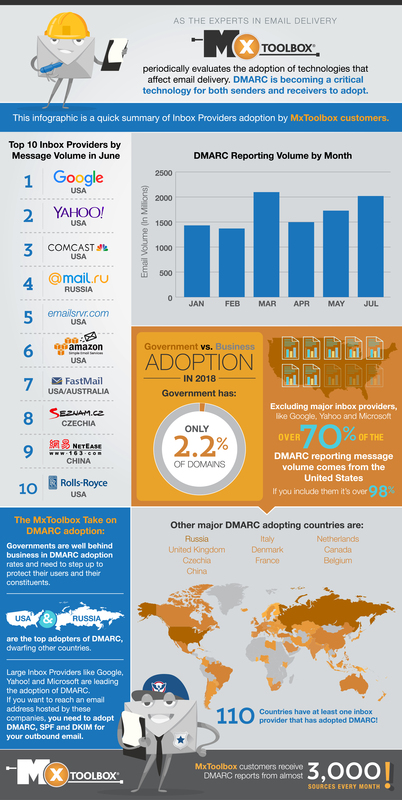 What is the State of DMARC Adoption? DMARC adoption is moving quickly with thousands of large, medium and small companies using DMARC to screen their incoming email. Our customers alone are getting reports on their billions of emails sent monthly and improving their email delivery configurations with the information they receive. Large Inbox Providers worldwide are dominating the adoption of DMARC technologies. Google and Gmail dominate with over 70% of the reported email volume. If you are hoping to send email to a Google address, you must adopt DMARC reporting. Government adoption appears to be lagging. With less than .1% of the message volume in our sample, government adoption appears to need strengthening, but the US and UK are leading the way. What do you need to do to protect your email deliverability? Adopt SPF to designate who your authorized email providers are. Configure DKIM with all your email senders to sign all outbound email cryptographically. Setup a DMARC record to start receiving reports from inbox providers on the compliance of your emails with SPF, DKIM and DMARC standards. Update your configurations to improve compliance. Block spoofers by moving to a more restrictive DMARC policy. Consider using a DMARC reporting provider like MxToolbox Delivery Center to process DMARC reports from inbox providers to get a complete picture of your email deliverability. You rely on email for business critical communication, so you need to know your email has been delivered to your customers and what technologies affect email delivery. MxToolbox Experts are here to help you understand email deliverability.